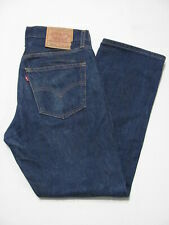 Vintage Redline Levi’s 501 Faded 30x28. No tag. Actual size waist 30 inseam 28. Local pick up available. Inquire about pick up before bidding. I combine shipping. Wait for invoice before paying. Buyers with low feedback rating must pay immediately or order will be canceled. Payment required within 24 hours. A bid is a commitment to buy! Serious bidders only! *Questions welcomed. *Additional photos upon request. No refunds. Copper rivets - stretch denim - light wash - red tab. Inseam 28”. The back label has a hole shown in pic. Very good condition. SIZE IS 26"W AND 28" L. THESE ARE IN GOOD CONDITION. 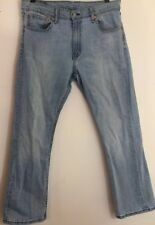 These are a pair of Levi’s 501s. Not sure of the age. They are more tapered than most 501s and are distressed showing a number of rips and tears. Perfect fits for guys who want something a bit more fitted or a girl looking for a boyfriend fit. They can be belted and/or cropped for a great look. THE JEANS FEATURE FOUR POCKETS AND A TALON 42 ZIP FLY. 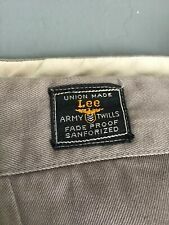 THE JEANS ARE NOT MARKED MADE IN THE USA BUT THESE WERE MADE IN THE US. THE INSEAM IS 28" TO CENTER. THE LENGTH IS 43". Pant leg circumference is 22". Not Jnco or Kikwear but hard to find retro Levis. Fits like: 32x28. Rise: 11.5". Color: dark blue indigo. Across leg opening: 7.5". Fabric: cotton. They have #647 on the back of the button. Do not rely on just the size stated! Overall length: 37". These were my jeans. They were a favorite pair but they are too big for me now. They are super soft and comfortable. They are a 1990's reproduction of the old 1930's style of Levi's. The waist measures about 35” . The tag reads 34 x 30. But The inseam is 28”. You will love these jeans if this is your size. They are lightly worn with no smells damage or tears or stains. Come clean and from a smoke free home. Inseam Length: 28". Waist: 14.5" (29" around, un-stretched). Doing that is against U.S. and international laws. Therefore, many of them will show light signs of wear. Denim Jeans. Zipper Fly. 29" Waits / 28" Inseam / 10" Rise. 64% Cotton 36% Polyester. (4)VTG 80S 30 X 32 LEVIS 517 CORDUROY DENIM JEAN BROWN TAN CORD BOOT CUT PANTS. COLOR: BLUE. T'S,POLOS, BUTTON UP SHIRTS, WINDRUNNERS/WINDBREAKERS CONDITION: NICE EACH HAVE A UNIQUE FADE FLAW OR MINOR WEAR. Across the front from side seam to side seam (ALREADY DOUBLED) . Across the front at the widest point from side seam to side seam (ALREADY DOUBLED) . From top of the waistband to the bottom hem. From side seam to side seam across the cuff of the pants. This is a killer pair of 1970s high waisted bell bottoms with studs down both legs. They are Male Slacks Jeans brand. They are in really great condition except for one light spot on the back. Other than that they don’t show a lot of wear. The previous owner took the waist in 2 inches. There are 2 1” darts added to the front. Waist - 27” (could be released to be 29”) Hip - 38” Rise - 11” Inseam - 28” Leg Width at hem - 20” This is a vintage item and is sold as-is. I’ve done my best to describe it accurately, but if you have any questions, please ask before buying. Please check your measurements carefully to make sure it will fit. Check out my other listings! I will combine for shipping when possible. Vintage Levis 501s. Really nice wash. They've been tapered just like Re/Done jeans. So you get a nice tapered fit. They can be easily let back out to the original straight cut. Really unique acid wash - never seen a pair like this before. Selling from the collection of a Levis collector unloading a few pairs to make room for some more! Check out the other listings. Size 30x28 approx, measurements are in photos. Description material 100% cotton made in USA #6 stamp single stitched back pocket button fly Condition The jeans are in excellent condition Please check pictures for further details on the condition Size & Measurements waist (doubled):54 hips (doubled):60 rise:17 inseam:28 leg opening:10 1/2 # 11867. No big E or redline. Good pre-owned condition. The only interior label says "B68.". These jeans are structurally sound and wearable with no holes or tears. Therefore, many of them will show light signs of wear. Inseam Length: 28". Waist: 16" straight across the top, laid flat. The jeans pictured are the exact pair you will receive. Style: 501 Straight Leg / Button Fly. Perfectly worn in jeans are a staple of the Vagabonds Grunge Revival collection. Inside Leg: 28". Waist (doubled): 32". Good to excellent condition. View all pictures as they are part of the description. Measurements: 28" waist, 25 1/2" inseam. I am the original owner of this item. Comes from a smoke free home. Ask all questions, as all sales are final. No returns, no refunds. No international sales. VTG Oshkosh B'Gosh Engineer Striped Overalls, Size 34 x 28, made in the USA in excellent pre-owned condition. Great natural wear. This type of distressing cannot be done by machines! These are the real deal! 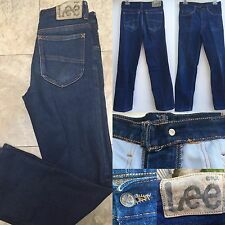 Large E rivets and other attributes associated with LEE jeans of the era. Waist Size 32. Made in USA. Great dark blue color! Inseam: 28". Item will be tightly folded. In general, we do not dry clean. MADE IN USA VERY GOOD CONDITION. High waisted button/zip closure. Jeans are in perfect condition. Show no signs of wear! Very rare find! Waist to bottom hem 40”. Preworn used condition dark blue denim. Preworn used condition with dark blue denim. Waist: about 43". -64% cotton, 36% polyester. -Inside seam of right leg has a large area of discoloration and a pretty crude repair that is about 10". -Colors will vary a bit on different monitors and in different light. But in great shape, just need a wash.